When I started designing the campaign, I put in code for repairs to ships, where you could repair individual pieces of damage. An attack on a ship might damage a module, doing 25% damage to it. You could repair just that specific piece of damage, if you so chose. The idea was that rather than just clicking ‘repair this ship, 1,240 CR’ you could spend less, if funds were tight, and just repair critical modules. I wrote a ton of code to generate slightly silly technobabble descriptions of each piece of damage. All of this is in the campaign and working. In practice, when testing the campaign I find myself invariably repairing the whole ship, or if funds are tight, just leaving it to the next turn when funds are available. The fancy repair interface is a bit overdone and over-engineered. However, I see no good reason to remove it entirely, it’s kinda fun, and allows micro-managing for those who want to, so it’s staying in. Something that did change today is the cost of repairs halved. Previously it was the same as construction. If a module cost 400CR and took 25% damage, it cost 100CR to fix. Now it’s 50CR. Why the change? Well in practice, repairs are reasonably rare. It takes time for ships to retreat, especially cruisers, and in battle, by the time you realise your fleet is screwed, the chances of all of them managing to turn 180 degrees and warp out are quite low. You often lose half the fleet during the retreat, unless you make an instant judgement at the first sign of the enenmy, and call an instant withdrawal. Combined with this, there is is the issue of repair yards. Not every system has them, so the damaged ships need to make a few warp jumps back to the nearest connected repair yard, before they get fixed up. By the time you do this, you might as well build new ships. So….. Repairs will be cheaper than new build. I think it balances out better this way, and it makes sense in gameplay terms anyway. The real frustration should be logistics, and having retreated and thus given up territory, rather than resenting the cost of repairs. I’m aiming for a ‘company of heroes’ style mechanic, where its sensible to retreat and fight another day, if outgunned. I was looking at a certain games portals ‘new releases’ list recently and saw tons of tiny bits of DLC for under 3 dollars. Very cheap. I assume that this stuff makes money, or at least breaks even. It got me thinking about the possibility of similar priced DLC for GSB. I’m not especially keen to do any more fully fledged expansion packs. I did three, and you’d be surprised how much work is involved in adding new weapon types and modules. The game is hugely involved now. The weapons for the order took ages to balance. The swarm was easier, but they still took a while. Right now, I’m 100% dedicated to the GSB campaign game, which is horribly complex to code (yet pretty simple to play, it’s not galciv or anything like it). As a result, I’m not about to make any new module types or other gameplay-affecting stuff. But then… is there a market for just new ships hulls? Either more hulls for the existing races, or maybe another new race, but one with no specific new tech. Just new visual shiny basically. Would people be interested? To do a whole new race costs a lot in artist time (and some cliff-time for the damage textures)., but if I could find a way to make it break-even, I’d do it. I love designing the ideas for new ships. It’s mostly artist work, so I can keep working on the campaign. Has anyone ever run, partaken in, or seen a ransomware model working? The idea is that people pledge money (and actually hand it over, it’s not just a promise) to a third party. When that amount reaches $X, the product is produced, and released (presumably for free?) and the developer gets the money. Kind of like donations, but with a target. If the limit isn’t reached, I assume the people get their money back. I hear people talk about this idea, but I’ve never seen it happen. have you? There is a tradeoff every developer is making when it comes to spending money. You either spend it on the product, or marketing and promoting the product. Now the romantically inclined might suggest that the best thing to do is just make the best possible game you can (100% product) and then the product will ‘sell itself’. Word of mouth news of your awesome game will do the work of the ad-men, and you will sell games by the bucketload. The cynically inclined might suggest that the best thing to do is to market the hell out of your game. It doesn’t matter if the product istelf is a bit rough, because if 20,000,000 people get to hear about it, then you are bound to find enough of them who are bored enough to hand over the cash. Obviously sanity lies somewhere in the middle. Finding out exactly where it lies, is not easy. To make a rational decision requires you to be able to measure the difference each dollar you spend actually makes. Clearly that is not easy. For me, spending money on ads is quite an easy decision, because there is only one of me. Doubling my ad spend doesn’t require any more of my (overstretched) time at all. So I’m not having to do a weigh-up of time on marketing vs time on the game. it’s much harder to weigh up anything that takes actual time away from coding. There is still the decision as to weighing up money spent on contractors (art, web design, sound) vs money spent on ads. And then of course there is the tradeoff between employing an artist (product) vs employing a PR guy (marketing). Personally, I’m wary of actually employing PR people. I’m a one man company. The ‘brand’ ‘story’ and ‘image’ of Positech games is just me. It would feel silly to have someone try and ‘re-brand’ me. That’s a level of corporateness which I don’t want to get into. Disclaimer: I sell my games on all these portals, and am happy with them as a business. So NPD think they have a list of the top 5 online games sales portals, but GamersGate and Impulse cry foul. Ok, fair enough. With gamersgate, I can see why they are in the position they are in. They were late to the party, didn’t have a killer-app that people wanted to buy, had an abortive attempt with a client they abandoned… so maybe they have had a tough ride. They seem to be doing well though, no doubt tons better than lil old me. Why doesn’t stardock run impulse at a loss? Maybe only a small loss, but a loss nonetheless. Give developers 95% share of the royalties (totally crushing any other offer), or maybe 80% but 95% if its impulse-exclusive for 6 months. Do not take a penny in profit for the next 2-3 years. Maybe instead of cutting the royalty split, just discount the games big-time like steam are doing. Or maybe buy out the rights to some games entirely to make them 100% impulse-exclusive forever. The prize at the end of this battle is market share. The web has 1 auction site, 1 book store, 1 video site and 1 social networking site. You know which ones I mean. It is close to having 1 PC games site, which is a license to print money. If I ran stardock, I’d sacrifice everything to fight for that slot. I’d probably run the whole business at a loss for those 2 years, taking every penny in profit from Object Desktop and throwing it at impulse to grab market share. In unrelated news, if you like tower defence/defense games, then you might love revenge of the titans. I just added it to my site (it’s by a fellow indie). There is of course a free demo, and it’s 50% off right now. Give it a go, it’s excellent. 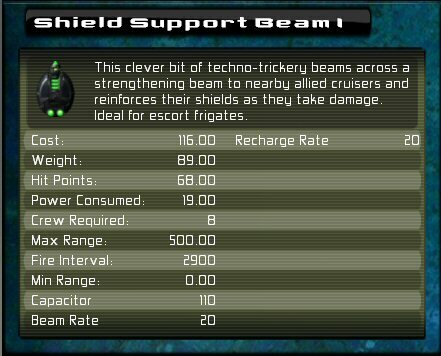 GSB recently got a shield support beam. This was a groovy empire-frigate-only weapon which remotely boosted the shield power of friendly ships. It was criticised as being too powerful. Not surprisingly, people experimented with minimal cruiser fleets boosted by a huge swathe of support frigates using the beams for mutual reinforcement. Surprisingly, this turns out to actually be super effective in comparison with filling those frigates with weapons and other useful stuff. I spent a while playing, and analyzing player challenges where it was claimed the SSB is just *too* good. So I nerfed it badly to see what was needed to get the sweet spot for this new weapon. Serious nerfing of the transfer rate was tried. Then serious reductions in the amount that would be held in capacitors. Still, the SSB seemed awesome, in large numbers. Then, eventually, I concluded that it was the mechanic, not the numbers that caused an imbalance. The SSB was being used regardless of the state of the target ship. It could be under intense plasma fire, and be ECM jammed, and still shake offf all attacks thanks to 6 or 8 SSBs boosting its shields. I wanted a single SSB to be worth having, but at any reasonable level, the combination of 8 then became a super-defence. The SSB can not be used to reinforce ships if the target ship is currently ECM jammed. Only a single SSB can be utilised on a target ship at any one point in time (although they could take turns). The SSB can only be targeted on cruisers. I think this is the solution, but feedback is much sought. After all, I stupidly thought it as balanced already :D Ideas?